Designed to resemble tile or wood, luxury vinyl flooring is often a much more affordable option. Durable yet beautiful, luxury vinyl is easy to maintain and clean, making it perfect for high traffic areas. Moisture, dent, and stain resistant, vinyl flooring is easy to install, and even easier to love. Available in various colors and styles, luxury vinyl flooring may be exactly what you need to transform your home. By working with Tampa’s preferred flooring experts, you can trust that when it comes to your flooring installation, we go above and beyond to present you with high-quality results that transform the entire look and feel of your home. 2 Day Flooring promises a prompt and reliable flooring installation no matter the size of your project. Luxury vinyl flooring is not only durable and easy to take care of, but it’s incredibly versatile and has a lot of options for installation. Each style of luxury vinyl flooring will have a different look, so it’s important to understand how each style is installed. Read more about the different types of vinyl flooring so you can pick the one that’s best for you. This style of luxury vinyl flooring gives the appearance of hardwood flooring because it’s installed the same way. Often, this style of vinyl is designed to have a similar texture and appearance as wood grain. Plank vinyl flooring is more durable, more resistant to stains, and more cost-effective than installing hardwood planks. 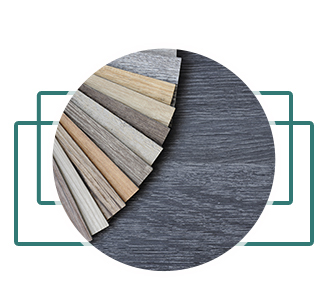 Vinyl planks are most commonly manufactured in sizes that are four to six inches wide and three to four feet long. Though the planks themselves are resistant to moisture damage, the seams between planks will need to be sealed to prevent moisture from seeping through. Luxury vinyl flooring that is made to look like tiles can also be installed the exact same way as tile flooring. Vinyl pieces can be arranged in different shapes and patterns that give them the appearance of tile or stone. To give an even more realistic appearance of stone or tile, vinyl tiles can be grouted without needing to be sealed afterward. The durability of vinyl is unmatched, but if for some reason some of the tiles are damaged, they are easy to pull up and replace. Sheet vinyl flooring can also be installed in large sheets that are anywhere from six to 12 feet wide. Often, a single area can be covered in one sheet of vinyl flooring because the sheets are so large. Sheet vinyl flooring is ideal for places where water or other types of moisture are likely to end up on the floor, like kitchens and bathrooms. Luxury vinyl flooring is available in a few different types of finishes to address the needs of different areas of your home. Think about the activities you do in each room of your home to decide which type of vinyl flooring finish will work best. Vinyl no-wax is the most basic vinyl flooring finish and is resistant to scuffs and stains. It works best in areas with a lot of traffic or areas where you know there are going to be spills. Rooms like the kitchen, mudroom, or entryways of your home are great for vinyl no-wax. Urethane is like vinyl no-wax, but the material has even more resistance and lower maintenance because of the finish. It will not show dark heel marks caused by shoes, and it will also not be damaged by most household cleaners or chemicals. This material option for vinyl flooring is great for the entire house because of its increased resistance to damage and ease of maintenance. Luxury vinyl flooring is also available in enhanced urethane, the highest quality of surface coating for your vinyl floors. It has the most stain and scratch resistance, is the most durable against high-traffic areas in your home, and will keep its lustrous finish longer than urethane or vinyl no-wax finishes. Luxury vinyl floors are one of the lowest-maintenance options you could choose to install in your home. That being said, they do need some TLC every once in awhile. Areas of your home that get a lot of sunlight, need to be cleaned more often, or have a lot of moveable furniture are areas that will need the most floor maintenance. Remember, though, that these areas will need the most maintenance regardless of the type of floor you have installed. 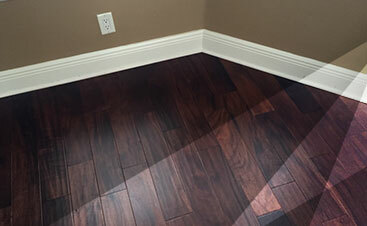 Though your vinyl floors are resistant to many types of damage, they are still susceptible to damage from sunlight. Too much direct sun can cause your vinyl floor to warp or fade, but there are a few different solutions to prevent this from happening. Make sure you have curtains or blinds installed on all of yours windows so you can close them during hours where the sun is beating directly onto your floor. Another option to avoid sun damage is to lay out rugs. These methods will prevent your luxury vinyl flooring from becoming damaged or faded. If your floors are vinyl no-wax, then cleaning simply involves sweeping and damp mopping. If you spill anything on your floors, all you need to do is wipe the spill up with a damp cloth. If your luxury vinyl flooring has a urethane or enhanced urethane finish, you can use household cleaners on them if you like, as the chemicals in these will not damage your floor. It’s not advised to use cleaning products on vinyl no-wax, however, as it does not stand up as well to chemicals. Luxury vinyl flooring may be resistant to scuffs and scratches, but it isn’t immune. Add another layer of protection between the bases of heavy pieces of furniture and your floor. You can apply furniture pads or, if you’re rearranging furniture, there are moving pads you can place under legs that will help furniture slide more easily without scratching the floors. This will keep your floors looking brand-new for longer. 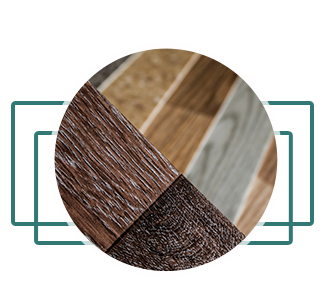 The most standard colors and patterns for vinyl flooring are ones that emulate the look of genuine hardwood, stone, or tile. You can choose other unique colors and patterns for your luxury vinyl flooring too, though. There are two methods in which your selected color and pattern can be applied to your vinyl flooring. If you are looking for a richer finish for your color, you can have the color granules embedded into the vinyl sheets. This type of application is called inlaid. The other application style for vinyl is printed, where the color and pattern is printed directly onto the vinyl. This application works best if you’re having your vinyl installed in sheets. Though your luxury vinyl flooring is durable and resilient, you can have additional protection installed with your floors. 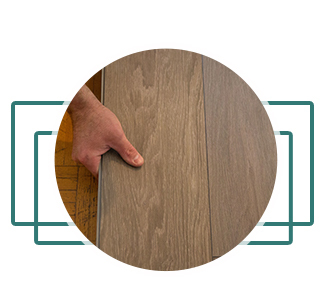 Backing is just what it sounds like — it goes on the back of your vinyl flooring to create another layer of protection against moisture and mildew. 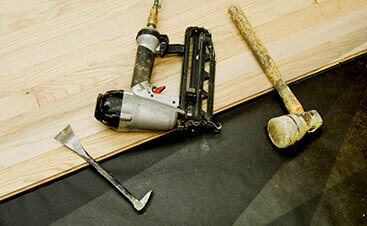 Our team of honest professionals ensures when you work with 2 Day Flooring, you are working with the best. Putting your needs first, we believe in making your floor installation our top priority, taking care of your needs from start to finish, and providing you with a superior level of service. Working in the flooring industry for more than 10 years, we understand what you are looking for. Never settling for anything other than the absolute best, we do whatever it takes to ensure that your luxury vinyl flooring installation exceeds your expectations. Providing high-quality flooring products is not just a goal, it is our promise, each and every time. To schedule your vinyl flooring installation, or to speak with one of our flooring specialists, get in touch with us today by filling out the information below.